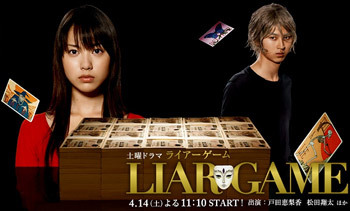 Based on the manga series of the same name, Toda Erika plays an honest college student, Kanzaki Nao, who receives a hundred million yen one day, along with a card saying she has been chosen to take part in the "Liar Game". The aim of the game is to trick the other players out of their hundred million dollars. At the end, the winner gets the hundred million and the loser is a hundred million yen in debt. The next day, she receives notification that her opponent is her former teacher, Fujisawa Kazuo. She goes to him, seeking help, but ends up getting tricked into handing her money over. Desperate, she approaches the police for help, but they are unable to do anything. However, she is told of a mastermind swindler, Akiyama Shinichi, who is to be released from jail the next day. Desperate, she goes to him for help.